Or get them for yourself, since you've already waited this long to buy presents. 1. A foldable laptop stand that'll make watching TV, having a morning coffee and a snack, and...yes, even working...infinitely cozier. Bonus: It folds up compactly, so storing it is a breeze! Get it from Amazon for $21.99+ (available in two colors, plus a nice wood grain option). Promising review: "I love this table it gives me enough room for my legs and plenty of room for my 15.6" laptop while using a mouse. I love doing homework on bed and i can use it for food too. it is a great buy" —Albert M.
2. A handy gadget to make perfectly al dente pasta right in the microwave for the easiest dinner ever. Just heat it up and then cover with the lid (it doubles as a strainer) to drain. 3. The SipCaddy, a wine glass (or beer can!) holder that'll suction cup to your bathroom wall so you can more easily enjoy your relaxing beverage of choice in your bubble bath. 4. A set of reusable toaster bags for anyone who is seriously craving a grilled cheese but does NOT want to dig out the frying pan. They can be washed in the dishwasher and reused 100 times! 5. A book filled with three-ingredient cocktail recipes for people who want to feel sophisticated without putting a ton of effort in. Get it from Amazon for $12.91, Barnes and Noble for $11.99, or a local bookseller through IndieBound. Promising review: "Lots of fun and easy drink recipes. It's great for all different times of the year such as summer and holidays. There are so many varieties you can practically please everyone with a special cocktail." —Lorri B. 6. And a to-do list of what you haaaave to get done today (with a column for what to procrastinate also) so you can *enjoy* one of those three-ingredient cocktails. 7. A pair of socks for anyone who likes to ~wine~ about having to get up for a glass of the good stuff. Get them from Amazon for $14.99 (also available in chocolate and coffee). 8. A braided, fray-resistant 10-foot lightning cable so you can charge your phone while playing games on it from bed without being pressed up against the wall. Get it from Amazon for $11.99+ (available in five colors). 9. A trio of snowball makers that'll transform any cotton-headed ninny muggins into a Buddy the Elf–level snowball whiz without any effort whatsoever. 10. An adorably sleepy bulldog who'll inspire you to live your more-relaxed life. Get it from Amazon for $15.69. 11. An ~eggsistential~ book written by Gudetama the lazy egg himself, so you can think philosophical thoughts while lazing about in bed. It's called being productive! Get it from Amazon for $7.54, Barnes and Noble for $9.99, or a local bookseller through IndieBound. 12. Insanely cozy slipper socks with a thick sherpa fleece lining and rubber soles so you don't go skidding on shiny floors when you DO finally get up to make a snack. Get them from Amazon for $24.99 (available in 72 colors and patterns). 13. A subscription to Care/of, which delivers personalized vitamins based on health concerns, diet, and lifestyle. Because you know you can't remember to, like, go out and buy vitamins. They personalize your daily vitamin pack according to your needs — just fill out the quiz and they'll come up with a suggested vitamin regimen. They even include information as to what the benefit of each supplement is and what studies there are to back it up! Subscriptions start at $5 per month. 14. A set of spill-proof wine glasses so if you fall asleep with red wine in your hand, your couch will stay stain-free. Meaning you won't have to clean it. 15. An expandable bathtub caddy that'll make a relaxing soak with a book and a glass of wine so much easier. Get it from Amazon for $34+ (available in two colors). Promising review: "I got this for my mom after my parents re-did their bathroom, and she LOVES it. It's a cute and practical bathroom accessory and the wires on each side expand to fit the size of any bathtub. Also love how you can fit a wine glass in it and it won't spill into your bath. My mom has had this for a while now and it hasn't shown any wear or water damage throughout many baths." —Leia V.
16. A stress-relieving sloth coloring book to help ease your mind when you're not sure which place to get delivery from. Get it from Amazon for $6.99, Barnes and Noble for $6.99, or a local bookseller through IndieBound here. 17. A microfiber makeup-removing cloth designed to remove every trace of foundation, (waterproof!) mascara, and lipstick with just water — so you can get to sleep THAT much faster. 18. An Amazon Echo with voice-control technology so you can tell Alexa to play music, send messages, tell you the news or weather, control smart devices, make purchases...and so much more. 19. A stapler you can use when you boss walks by and you suddenly need to look like you're actually doing something instead of eating your another desk lunch. 20. A gooseneck phone holder so you can video chat, stream video, or play music...all hands-free. 21. A binge-watching guide to 100 television shows so you can Netflix marathon with pride — hey, TV is so good these days it's really like reading a book! Get it from Amazon for $9.95, Barnes & Noble for $9.95, or a local bookseller through IndieBound. 22. 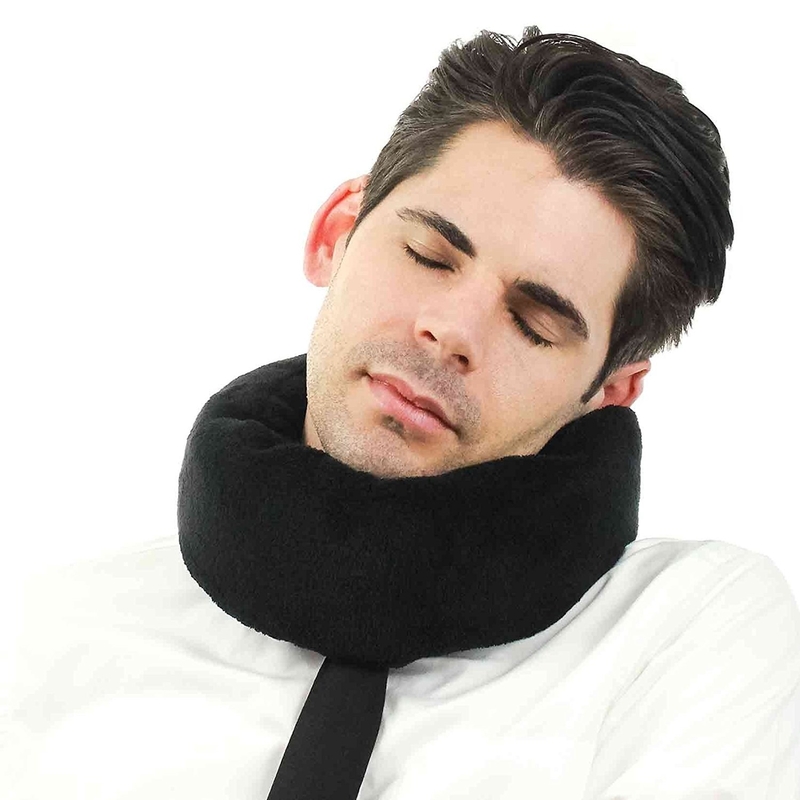 An adjustable fleece neck and head wrap so you're always ready for nap time wherever you roam. And it's machine washable for peak lazy cleaning. Get it from Amazon for $25 (available in five colors). 23. A pair of bunny slippers that'll sweep and dust the floors while you walk to the kitchen for a snack. You can also detach the mopping part, if you just want to chill. Promising review: "This product is the best of both worlds! It's functional AND cute! Great for wearing around the house, especially if you have hardwood/tile floors." –Becky M.
24. A food chopper with two different size blades and a storage container so you can chop and store right in the same tool! Pressing a lever down = way easier than using a knife. And all the parts are dishwasher-friendly, because duh. 25. 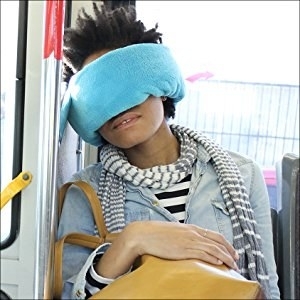 And an attachable phone handle to finally stop that thing where you're lying down and you drop your phone on your face. Live your best life, my friends.